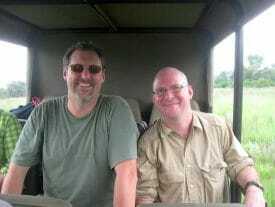 Bill Given (left) and Dave Fox in Botswana on a travel writing safari they guided together in 2010. Wildlife biologist Bill Given is on a mission to shake up the African safari industry. Owner of the Wild Source safari company, Bill says too much of the money travelers spend on safaris is going to outside companies in big cities and foreign countries. He is my guest on this month’s episode of the Globejotting Travel Show on Expat Radio. Bill has helped launch three new and unique safari camps in Botswana, Kenya, and Tanzania. His camps are empowering local residents to be directly involved in the ownership of safari camps in their rural communities. In our interview, he explains why he thinks this is so important, and he also shares tips on how to decide when and where to go on your first African safari. Also on this month’s show, a tribute to South African musical icon Johnny Clegg. After decades of song-and-dance-fueled political activism, Clegg, who is currently in remission from pancreatic cancer, has announced he’s retiring from his courageous musical career.